ESO and an international consortium of institutions  have signed an agreement under which the planned BlackGEM array of telescopes will be sited at ESO’s La Silla Observatory in Chile. BlackGEM will contribute to the study of merging black holes and neutron stars, and the agreement with ESO will ensure that this exciting new telescope array benefits from one of the best observing sites and associated facilities in the world. The BlackGEM array — initially an array of 3 interconnected telescopes, with the aim of expanding to 15 telescopes — is being designed to take its place at the cutting edge of observational astronomy. It will join the search for some of the most powerful and dramatic events in the Universe — merging neutron stars and black holes. BlackGEM will look for these events in visible light, following up detections of the characteristic gravitational waves arising from the merging of these highly exotic objects. The gravitational waves themselves — ripples in the very fabric of spacetime — are already being seen by the new generation of gravitational wave detectors, such as Advanced LIGO and Advanced Virgo. A detection of an optical transient signal by BlackGEM will pinpoint the sources responsible for the gravitational waves so that bigger telescopes can carry out more detailed observations, providing us with unprecedented insight into some of the cosmos’s most extreme events. The BlackGEM array will also function as a highly capable survey telescope and will spend some of its time producing a survey of the southern skies, as well as in-depth studies of short duration transients, unrelated to gravitational wave events, and short-period variables, possibly progenitors to merging neutron stars and black holes. Detailed surveys provide astronomers with statistical information about objects in the sky, enabling, for example, studies of how galaxies evolve from the early Universe until now. 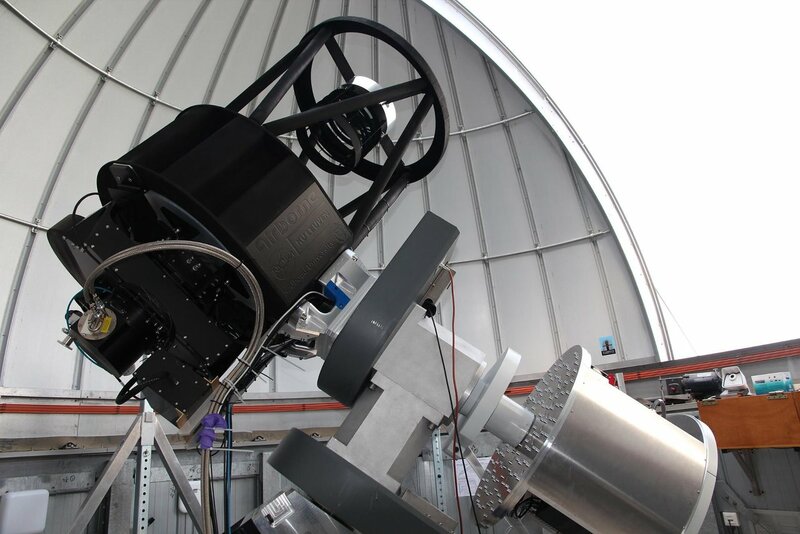 Paul Groot, principal investigator of the BlackGEM project, said “I am delighted that the BlackGEM telescope will be located at ESO’s observatory in La Silla, one of the best observing sites in the world. The recent momentous detections of gravitational waves from merging pairs of black holes give added impetus to the BlackGEM project, which will allow us to investigate further the events that give rise to gravitational waves. We can look forward to obtaining a detailed picture of some of nature’s most powerful events”. The BlackGEM consortium comprises: NOVA (Netherlands Research School for Astronomy, the national Dutch alliance in astronomy between the University of Amsterdam, University of Groningen, Leiden University and Radboud University); Radboud University, the Netherlands; and KU Leuven, Belgium. New partners joining the consortium will be the University of Manchester, United Kingdom, the Weizmann Institute, Israel, the University of Tel Aviv, Israel, the Hebrew University of Jerusalem, Israel, the University of Canterbury, Christchurch, New Zealand, and the University of California, Davis, USA.